Oh, the weather outside is delightful, and so is the lineup of local holiday festivities. Here are 100 joyful ways to celebrate the season both indoors and out. A spectacular drive-through display of illuminated trees and animated figures. $12-$17/vehicle. 6-10pm, Tradewinds Park, 3600 W. Sample Rd. Use a flashlight to find candy canes hidden around the park. Event also includes bag decorating and a short holiday movie. Ages 3-8. Parental supervision required. Space is limited. $10/resident, $15/non-resident. 6:30-8pm, Coconut Creek Community Center, 1100 Lyons Rd. Join Promenade at Coconut Creek and Broward Family Life magazine for a spectacular holiday celebration featuring more than 40 exhibitors, interactive games for kids, festive music, face painters, on-stage performances, fire truck rides, surprise character visits and more. Santa will be on site starting at noon for photos. Free. 11am-6pm, Promenade at Coconut Creek, 4443 Lyons Rd. Twinkling lights and luminaire candles, youth performances, children’s activities and a craft show. Visit with Santa at the gazebo. Free. 6-9pm, Memorial Park, between City Hall and the Community Center on 90th Ave.
Make a craft, play holiday games and receive a photo while visiting with Santa. For residents only. Pre-purchase required. $10/adult, $7/child. 10am, Cooper City High School, 9401 Stirling Rd. Bring the family for some holiday treats, snow and other fun winter surprises. Free. 5-9pm, City Hall, 9500 W. Sample Rd. Walk through Bethlehem of 2,000 years ago, experience the sights and sounds of the marketplace and streets crowded with families taking the census, and see the Christ child in the manger. Donations accepted. Friday, Monday & Tuesday, 7-9pm; Saturday & Sunday, 6-9pm. First United Methodist Church of Coral Springs, 8650 W. Sample Rd. A delightful production of the holiday classic by the International Ballet Company. Saturday 2 & 8pm, Sunday 2pm. The Center, 2855 Coral Springs Dr.
Evening includes the lighting of holiday displays, trees, kinaras and menorahs, live holiday musical performances, a living nativity and a horse parade with the arrival of Santa. Free admission, with some activity fees. 6-8pm, Davie Town Hall, 6591 Orange Dr.
Bring the family for a visit with Santa, petting zoo, pony rides, a hayride and old-fashioned games. Noon-2pm, Old Davie School Historical Museum, 6650 Griffin Rd. Bring your little one for Hanukkah-themed songs and stories. 10:30-11:30am, Young at Art Museum/Broward County Library, 751 SW 121 Ave. Create a hand-crafted ornament or gift box decoration by using recycled wrapping paper. Included with paid museum admission of $12/Broward resident. 10am-2pm, Young At Art Museum, 751 SW 121 Ave. This Charles Dickens classic is told with a musical twist in this heartwarming musical adaption presented by Florida Children’s Theatre. Friday 7pm, Saturday & Sunday 2pm. Bailey Hall at Broward College, 3501 Davie Rd. $12.95/child or $9.95/after 5pm. 5-8pm, Flamingo Gardens & Wildlife Sanctuary, 3750 S. Flamingo Rd. Broadway Kids Studio presents this beloved holiday story about Buddy the Elf and his quest to find his true identity. 2 & 7pm, Miniaci Performing Arts Center, 3100 Ray Ferrero, Jr. Blvd. Help Mrs. Claus pass out gifts to all the good critters, visit with Santa and play in the snow from 2-5pm. Stick around after 5pm to see the Garden of Lights display. Included with daytime admission of $19.95/adult, $12.95/child. Flamingo Gardens & Wildlife Sanctuary, 3750 S. Flamingo Rd. A New Year’s Eve party with kid-friendly activities including a Balloon Drop at noon, entertainment, New Year’s activities and more. Free with admission of $12/Broward resident. 10am-3pm, Young At Art Museum, 751 SW 121 Ave. Hold your breath for an underwater picture with Santa. $5 per photo. 10am-noon, Aquatic Center, 501 SW Sixth Ave.
Start a holiday tradition by taking a hayride around the park and enjoying an old-fashioned marshmallow roast around a campfire. $3.50. Advance tickets required. 6:30-9pm, Quiet Waters Park, 401 S. Powerline Rd. Celebrate the season with a make-your-own ice cream sundae, Christmas carols, crafts and a chance to meet Santa. Free. 6:30-8:30pm, Johnny Tigner Community Center, 445 SW Second St.
An inspirational spectacle featuring a festive opening with familiar carols and contemporary songs, followed by a musical drama of the nativity and life of Christ. Ages 4 & up. Check website for days, times and cost. First Baptist Church of Fort Lauderdale, 301 E. Broward Blvd. Put on your pajamas and climb aboard this one-hour magical trip to meet Santa. Set to the sounds of the motion picture, the adventure includes hot chocolate, a cookie and a keepsake sleigh bell. $50-$70. Brightline Station, 101 NW Second Ave. Enjoy holiday cheer and family fun at an event featuring activities, entertainment, lighting of a holiday tree and more. Free. 3-7pm, Joseph C. Carter Park, 1450 W. Sunrise Blvd. $25/child. 10am, Museum of Discovery and Science, 401 SW Second St.
An evening for families with live entertainment, a story time, arts and crafts, face painting and more. $20/adult, $5/child, 6 and under/free. 5:30-8:30pm, Bonnet House, 900 N. Birch Rd. Join Robin Spielberg for sing-along songs,fun stories and concert films. $17.50-$35. 2pm, Broward Center for the Performing Arts, 201 SW Fifth Ave.
A holiday singing spectacular with clips from movies including The Polar Express and Home Alone, set to a full symphony. $55-$75. Showtimes vary. Broward Center for the Performing Arts, 201 SW Fifth Ave. The Miami City Ballet presents George Balanchine’s dazzling choreography. Showtimes vary. Broward Center for the Performing Arts, 201 SW Fifth Ave.
Fun for the whole family with rides, inflatables, face painting, rock climbing, ice skating, music, fire juggler, a menorah lighting and more. Free admission, nominal fee for food and rides. Noon-5pm, Huizenga Plaza, 32 E. Las Olas Blvd. Immerse yourself in the captivating sights and sounds of this concert performance and film featuring the South Florida Symphony Orchestra. $35-$155. 8pm, Broward Center for the Performing Arts, 201 SW Fifth Ave. The Arts Ballet Theatre transports the audience to a land filled with snowflakes and sugar plums in this holiday classic. $21.50-$41.50. Parker Playhouse, 707 NE Eighth St.
See the Victorian holiday decorations of the Historic Stranahan House Museum and take a boat ride along the New River to view homes decorated for the season. $30, reservations required. 7pm, Stranahan House, 335 SE Sixth Ave.
Santa and his elves spread good cheer and candy on Fort Lauderdale Beach. Santa arrives at 12:45pm. Fort Lauderdale Beach Park, 1100 Seabreeze Blvd. Family celebration focuses on the principles of Kwanzaa. 12:30pm, African-American Research Library and Cultural Center, 2650 Sistrunk Blvd. Bring the family to celebrate the fourth principle of Kwanzaa, cooperative economics. 2-5pm, Bass Park, 2750 NW 19 St. Celebrate Hanukkah with music and a menorah lighting by the sea. 5:30-8:30pm, Beach Pavilion, One Commercial Blvd. Spend an enchanted evening with holiday fun and activities. 6:30-8:30pm, Frank McDonough Park, 3500 NE 27 Ave.
A live Nativity scene brings the story of Christmas to life after the Trinity Worship Team sings Christmas carols at the sanctuary’s main entrance. Free. 7:15-8:15pm, Trinity Church, 3901 NE 22 Ave. Put on a holiday hat for a hayride around the park, and a marshmallow roast around a campfire to make s’mores. Advance tickets required. $3.50/person. 6:30-9pm, Easterlin Park, 1000 NW 38 St. Wear your jammies for some holiday songs, stories and crafts before bedtime. 7pm, Southwest Regional Library, 16835 Sheridan St. Kids ages 6-11 can make their very own holiday keepsake. Pre-registration required. 2-3pm, West Regional Library, 8601 W. Broward Blvd. Games, stories, music and activities at the library’s Big Winter Holiday Party. All ages. 6-7:30pm, West Regional Library, 8601 W. Broward Blvd. 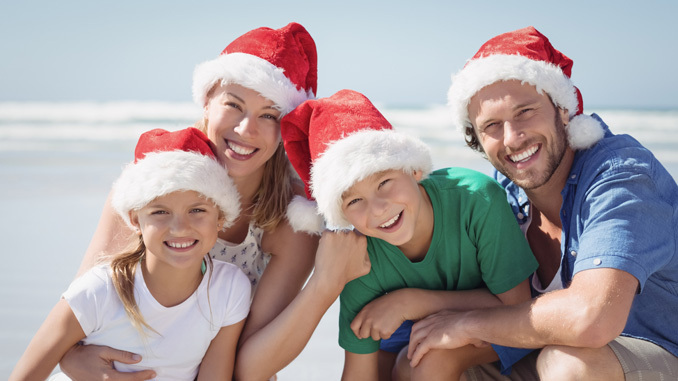 Put a festive spin on fitness with a 5K run and fitness walk for the whole family. Includes an Elf Romp for kids 10 and under and a Youth Mile course. Registration fee depends on age. 5K begins at 8am, Sunset Park, 10600 Cleary Blvd. This fundraising effort attracts more than 30,000 motorcycle riders for a parade through the county to benefit Joe DiMaggio’s Children’s Hospital and other children’s charities. Line up on the streets to watch the motorcycles. Gates open at 6:30am; ride begins at 9:30am, Festival Marketplace, 2900 W. Sample Rd. The South Florida Jubilee Chorus performs a holiday show featuring popular songs of the season. $22/adult, $6.50/child. 2pm, Pompano Beach Cultural Center, 50 W. Atlantic Blvd. Kids can ring in the holidays with activities and fun for all ages. 2pm, Northwest Branch Library, 1580 NW Third Ave. Event combines what was formerly the Woodstock Arts and Crafts Festival with a magical winter wonderland complete with snow, holiday games, a visit from Santa and more. Festival is free; Winter Wonderland $5. 10am-4pm, Sunrise Athletic Complex, 11501 NW 44 St. The Russian Ballet of Orlando presents the holiday classic about a young girl who dreams of a Nutcracker Prince. All ages. Reserved seating, $18/adult, $10/child. 1pm & 5pm, Sunrise Civic Center Theatre, 10610 W. Oakland Park Blvd. This fundraising effort attracts more than 30,000 motorcycle riders for a parade through the county to benefit Joe DiMaggio’s Children’s Hospital and other children’s charities. Parade begins at Festival Marketplace. Line up on the streets to watch the motorcycles, or wait for their arrival in Markham Park, 16001 W. State Road 84, where there will be live music, a huge motorcycle show, vendors, food and more. $20 and one unwrapped gift, or $30. Come meet Santa and his elves and enjoy arts and crafts, trail to the North Pole and raffles. $15/ages 3 and up, $10/ages 2 and under. Noon-4pm, Flippo’s Indoor Playground and Cafe, 3868 N. University Dr. Kick off the holidays with the city’s official tree and menorah lighting. Free. 6-8:30pm, Tamarac Community Center, 8601 W. Commercial Blvd. A holly jolly night of fun featuring reindeer games, bounce houses and activities and a special appearance by Santa. 6-8pm, Tamarac Park, 7501 N. University Dr. Dogs can be photographed with Santa and participate in a howling holiday time. 9-11am, Gary B. Jones Park for People and Pups, 8101 Southgate Blvd. Join Santa to kick off the season with a tree lighting and other entertainment. 4-8pm, Weston Town Center, 1675 Market St. Kids ages 5-11 can create a special wintertime craft. Pre-registration recommended. 3-4:30pm, Weston Branch Library, 4205 Bonaventure Blvd. Enjoy a pancake breakfast with Santa and friends, storytime, crafts, bounce houses, pony rides and more. $10. 10am-noon, Hagen Park Community Center, 2020 Wilton Dr.